This week we got back on track with our alphabet projects, although we didn't devote as much time as I'd like. I've been on a mission to get my baby to nap in his bassinet and this has taken up a lot of my time. I spend anywhere from 45 minutes to 1 1/2 hours each morning trying to get Ashton to nap in his bed, only to have him wake up 10-20 minutes later. Twice this week he did sleep 45 minutes, though. Sadly, that was a real accomplishment. Today, after a few long weeks of struggling against a willful 3 month old, he went down right away for his nap and then slept 45 glorious minutes! Speaking of sleeping, Sunday night we moved Ashton out of our room and into his own room. He still sleeps in the bassinet, though. It's pushed up next to his crib. He doesn't seem to like the "bigness" of his crib, so we'll keep him in his comfy bassinet for now. Spencer slept in our room for four months, and when we did finally move him to his own room, I wasn't ready. This time around with Ashton it was my idea to move him. I was so ready to have my room back! No more tip toeing and hushed voices at night. Ash is an extremely light sleeper, so I think our night noises (especially Dave's snoring!!) were waking him up. It was an easy transition, thankfully. Although Ash is still waking up anywhere from 1-3 times a night, at least he didn't get worse with the transition to his own room. This mama needs her sleep! So anywho....the letter this week was J. We started by painting on jeans. The paint pretty much disappeared once it was dry, but Spencer still enjoyed the process. To change it up a bit, I brought out his easel and he painted on that. I cut out upper and lower case Js to make the flashcard. Our only other project was to make jello jigglers. Tuesday Spencer helped me make the jello. He really enjoyed licking the whisk. Then we stuck them in the fridge overnight. The next day I got out some cookie cutters and let Spencer create shapes. He wasn't thrilled with the feel of the jello. Big shocker! He did enjoy eating it with a spoon, though. Besides the projects, we also discussed other things that start with the letter J. He especially loved jumping and talking about how Nemo's dad and Dory "boinged" off jelly fish in the movie Finding Nemo. than bagels and french dressing. 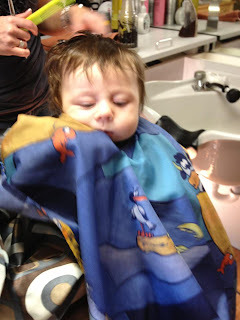 Last Saturday we took Ashton to get his first hair cut. 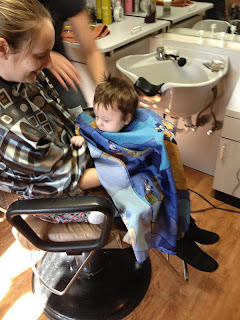 It seems completely wrong to me to cut a three month old baby's hair, but he desperately needed it! My hair lady trimmed around the ears, the back and his bangs. Now he's even more handsome, if that's even possible! He was a real trooper through the whole thing. Barely made a peep. Look at all those bubbles! My lil drool monster. This weekend is a big one in the Mahlke household. Ashton is getting baptized. I am very excited to have him officially blessed into the Christian faith and become one of God's children. And, of course, it'll be good to celebrate with family and friends.